What is “Weave with me”? A weaver's journey through time. As a research project – decided that I would like to look at one of our core books for learning about weaving and see if I could add information to bring the text into the digital age. Work completed so far, includes finding digital copies of the images in color, and creating .wif files of some of the draft collections in the book. In the early editions there is a bibliography that will also prove interesting to research to see who her influencers were. I have decided to publish my research as I go so that I can share with others and get feedback. For copyright folks – I believe that my work not a violation of copyright as I am acknowledging my source of reference, and it is in the public domain at this point in time. My intention is that of historic research, to help fill the gaps between when the book was written and today, hoping to keep the information accessible to future generations. Fees collected for downloads fund research and hosting of these files. I have just gotten my fabric off of the loom and already have requests for the draft. I have set it up for download from my shop page, the cost is $1. Please click on the link below to download your copy. Jennifer wrote to me and asked me about this draft she had found in a file. She was not familiar with this particular draft and wanted to learn more about it. My first step was to look at the blocks – the areas separated by the long lines. Most of the sections have 4 lines in them in two rows. It appears that this draft is on four shafts. Likely it is an overshot draft. I then wrote the draft out in my notebook, matching the lines and the threads by the block I identified. 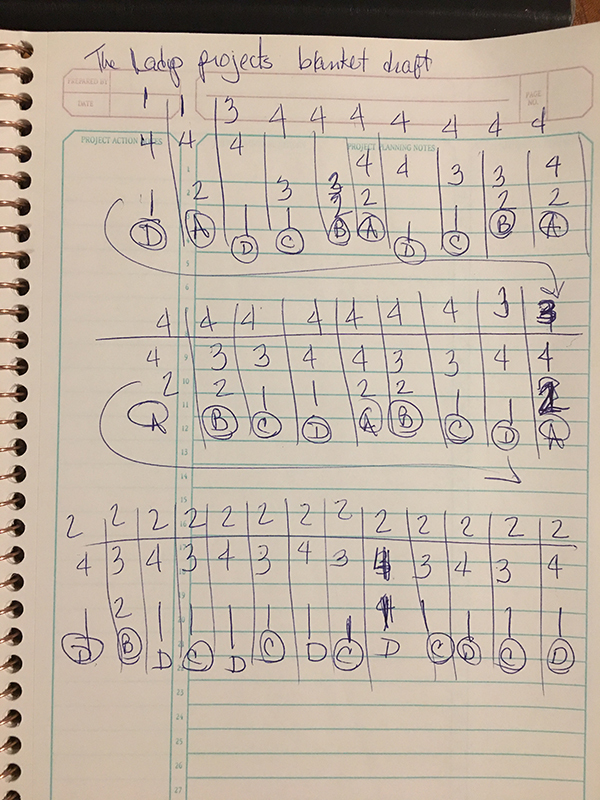 I then translated this into a profile draft by substituting the A Block for shaft 1, the B Block for shaft 2, the C Block for Shaft 3 and the D Block for shaft 4. Because some of the blocks had 4 threads and some only 2. I decided to use two threads to represent the four thread blocks, and one thread for the half block. I treated the 3 thread block as a two thread block for the profile. I set the tie up to ABCD, to match the blocks. I then selected tromp as writ, and colored the warp a contrasting color to make the design appear. While I was entering the draft into the iWeaveit program, I noticed that some of the draft was not even (balanced) I adjusted the draft to make it even. I had found one place where the draft did not move sequentially through the blocks. Usually overshot moves in a circular fashion through the blocks, jumping blocks can cause long floats to appear. You can see the area on the on the bottom line towards the left edge the block moved from D to B and back to D again. This is in one of the short blocks. This is not the way the other side of the block is, and so I adjusted it to match the beginning of the block sequence. At this point you can not weave the pattern, but you have a fairly good idea of what the design will look like when woven. The blocks in the threading move gracefully from left to right and the designed when woven will have that characteristic of a 45 degree diagonal line from bottom right to top left. 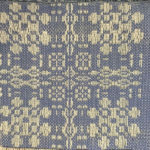 When this design is woven it will need to have a border and a number of repeats to match the size of the fabric desired. 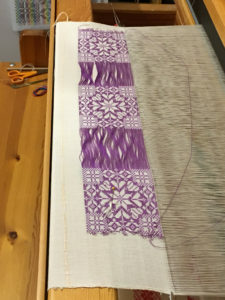 To repeat the design you would start from the top right of the threading and enter that sequence after the last thread on shaft 4 in the draft. At this point, you are missing the threads for the ground cloth. The tabby weave. 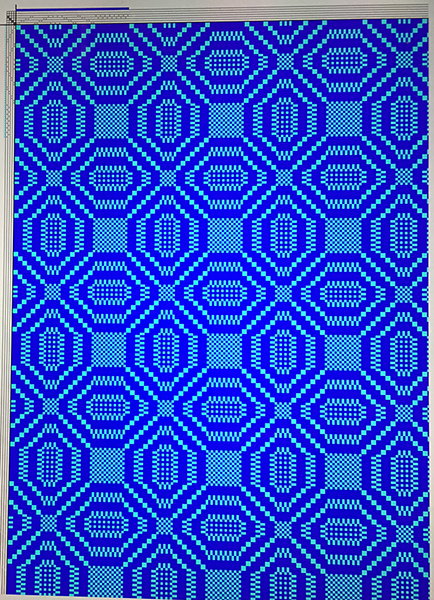 To weave this pattern I will need to decide what structure it is, and then change the draft to have that threading arrangement. I will show you how I do this in the next blog update. This is a quick look at the profile draft as it is repeated. There are tables (the big blocks) and smaller blocks in the middle. 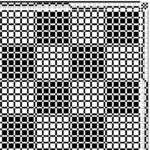 The pattern will look like the checkerboard you see, to prevent long floats. I am sure this pattern can have variations. This is a sample of what it would look like if it remained symmetrical. Still working with the 6 block sample idea. I have an existing sample of a special treadling that I used with the diversified format. In my last sample shown here, I am still not satisfied with the look of the whites treads. I have worked through the draft again and now am ready to wind another sample warp to test out my theory on the loom. Stay tuned for further updates through the weekend. 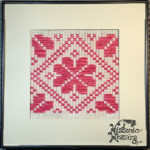 I have spent my morning working on the historicweaving.com website and I believe that I have the resources page looking and working much better than before. It was a bit of work, but I feel ready to move forward now. Afternoon update: Any good warp even a sample, requires planning and mine is no exception. I decided to get a bit more formal in the arrangement of the blocks so that it looks more finished when I am done weaving. Now to wind the warp and get started. Today was a fun sick day. I woke up not feeling well (cough,cough) and knew that going out was not going to happen. My next stop was the computer where I decided to play with the design that I shared with you last week. 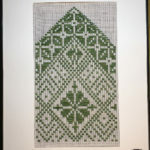 My goal, to turn the draft into a welsh tapestry design. I think I did pretty well. My best news of the day, it is possible for you to order this design as a throw in a few weeks. 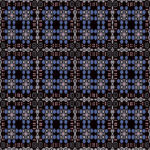 I have made contact with a company that allows me to create a design and they will weave it on their Jacquard loom. I am in wonderment! It has taken me a couple of tries to get the hang of how to set up the files so their system will run them. I can’t wait to order my first samples and see how they turn out. The website is WOVNS. Brand new — only six months old. I completed a whole vision board today. You might want to take a look — it is a pdf file. Vision Board – Angstadt 164 Should you be interested in these designs for some of your projects please let me know by email. This is a scarf that I wove in double weave on my 24 shaft AVL loom 11 years ago. 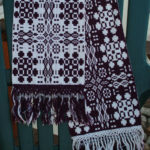 It was woven in burgundy and white cotton. I hand knotted the fringes and beaded it. I believe that I gifted this it was not sold. If you have it please send me a photo of you with it. Here is the image of the draft I used. I was using WeavePoint at the time, and I can now no longer open the draft file. I will post it here for someone who has WeavePoint, perhaps you can turn it into a .WIF file for me. My current weaving software is WeaveMaker. I am using a MAC system. What makes this piece special is that I used many ancient motifs to create a modern miniature coverlet looking image. I borrowed an overshot window pane for the borders edge, placed a star in the center. I then encircled it with hearts. I also used a twill structure to add interest to the hearts. All in a 6 inch space. It took several attempts to achieve a “square” look to the piece and here you see the end result. The time to weave this piece was over 8 hours. I had to work slowly and carefully to ensure that I did not make a mistake when pulling the pattern shafts. This is one of the most complex designs in the Opphamta series of images. I am very happy with the historic feel of this new design. A petite sweet gift that will fit anywhere and let that special someone know they are loved whenever they look at it. This is the first in a planned series of red heart images. Hearts are special to me, for love, and because they are part of my name. This piece took more than 4 hours to weave, it needed to be repeated a second time with a different weft thread combination to get it to weave squarely. The heathered look is caused by the fact that it was woven with four threads of different colors. 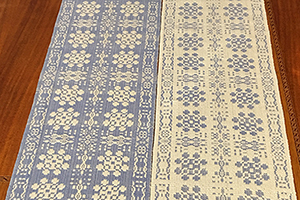 It was woven on a drawloom, threaded with 30/2 cotton with a sett of 48 ends per inch. I wanted a piece that would be green and have a Celtic feel. What better to convey this than a Shamrock? The background is filled with leaves. The design is a marriage of motifs, large leaves and the darker outer border of leaves. This piece took more than 10 hours to weave and I was very pleased with the design as it was forming on the loom. It looks like a fine lace from a distance. Let us begin our travel through time together. I have a passion for weaving, and the history that surrounds the art form. Yes, I did call it art, because for me that is what I am making, Fine Art. This website is designed primarily to share information that I have gathered about weaving in my weaving career. It is intended to be a compendium of information about equipment, design, structures, projects as well as lessons I have learned along the way. 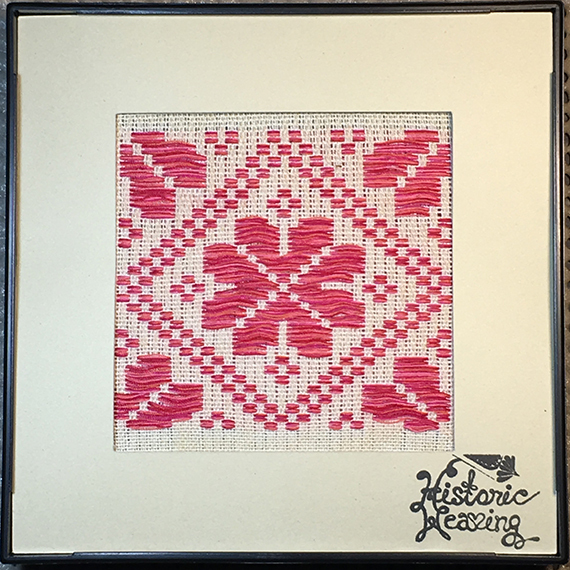 My passion involves studying weaving as it was done between 1600 – 1865 in both Europe and the United States. I will admit I am not a purist, everything that I produce is not an attempt to produce a museum quality reproduction of a fabric that I studied. I like to work like most modern musicians, study the classics, and then develop my own design using materials available to me. The loom you see here is Queen Esmeralda, she sits in my living room, and I began weaving pictures on her in 2016. 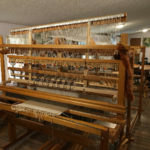 She is the size of a 150 Ford pickup truck, and may be the most complex loom that you will find in the state of Montana. As you look her over you will discover there are no computers or power cords. She is a hand loom in the truest sense of the word. In the Design tab I will discuss how I design my weaving projects. In the History tab will be information and links to stories about looms, weaver and their histories. The Looms tab, you will find information about looms both new and old. Open the Techniques tab, and you will see how a design evolves and what processes are used to move it forward. The Resources tab contains a searchable database with links to textbooks, articles and projects that you can use. What make this database special is that it will show you where to acquire the materials, either through purchase or a local library. This is where most of my research will be made available for others to use. You can use words to describe the structure, the loom or the weaver and search for materials that contain that reference. From the Weaving Ideas tab you will learn where do weave get their ideas? How do they change from first glimpse to final project? 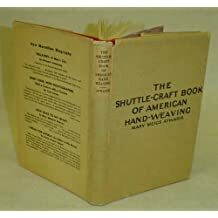 Weaving Instruction tab is where to find the teachers and classes that will help you to be a better weaver. In the Drafts tab, is a visual library of weaving drafts arranged by number of shafts needed to weave them. The About Me tab is where you will find my artist statement and contact information. 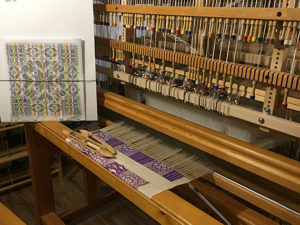 100 Loom Tour – click on link to find out more. 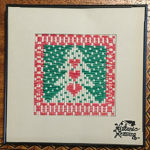 Give the gift of weaving for Christmas this year. When I discuss equipment, and how it can be used I am not attempting to be the ultimate historical resource, there are many in the academic community that are better at this pursuit than I am. My intent to give the viewer an idea of the type of equipment and its basic construction. I may make use of images in the public domain in an effort to place images in a context that the viewer can relate to. A new design for the 2016 holiday season. What made this project special is that I wanted to include my signature 3 heart logo in this tree. I also used this as one of my first efforts at polychrome Opphamta weaving. I used small cardboard pieces as bobbins. 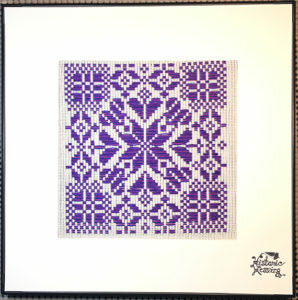 This piece took more than 8 hours to weave, while it is small 3″ x 3″; there was a lot of a hand work to be done to complete the image. At one point there were 21 bobbins in play. As you a see from the draft image, I have made special adaptions to my drawloom to make it easier for me to weave complicated designs. This design requires 31 draw shafts to weave. After a long time, almost a year. I finally had the time to get to this project. 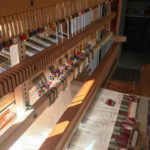 As I did, I discovered that I had set up my loom incorrectly and was not able to weave until I fixed the installation of the friction brake, and the clutch for the cloth advance. Thank you to wonderful people on the Weaver’s Tech list. During this process I did decide on an initial draft of the first towels. It is based on two different Jacob Angstadt designs, both are 12 shaft pointed twills blocks. I wanted to get a checkerboard effect without needing to use two shuttles. This was made possible by reversing the tie-up blocks. Now to the real work, weaving! The replacement dish towel project began when I discovered that my old towels had become stained, and a bit dingy as the result of a man being around the house. He seemed to forget they were handwoven and used them to mop stains on the floor, clean up snow mixed with granite gravel and asphalt, and of course, wiping the stove top off after cooking a spaghetti dinner. Like all men, he just wants to be forgiven, and like all women I just want my pretty dish towels back. My first steps were to look around the kitchen and discover the colors I wanted to use. 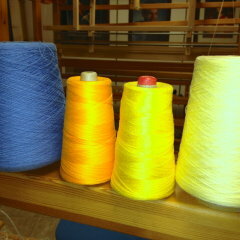 I happened to have purchased some beautiful denim blue 16/2 cotton, and have some yellow and white cones of thread. My first thoughts were to make the towels mostly blue in an effort to hide future dirt. I began wrapping thread on to cardboard strips to see what stripes I was most interested in. I found the wrapping task to be a bit tedious. Of course, I made the mistake of letting someone else in on the project, only to discover that they are not so interested in the blue background. They really like the yellow which matches the kitchen walls. I then scurry around on the internet and search for blue and yellow striped towels to get some ideas. In the process I discovered a few great design tools. A Stripe Generator, a Tartan Designer and a Color Picker. All are awesome diversions – yet none of them output to weaving software and thus none directly suited my needs. Back to the old fashioned way of doing things for now. I then made some sketches of the stripes that I found on the Internet for my purposes, I found my stripes by Googling for blue and yellow striped towels and selected the entry that displayed images, it looks a lot like Pinterest and I could just flip through the pictures looking for my favorites. I eventually decided that there were so many I wanted to try to make, that I should make my design using an all white warp so that I can change stripes whenever I like. Me being me, I can not weave in a plain weave when I have a loom that has 24 shafts! So I selected to use a 16 shaft point twill as a base structure. I learned during my stay in Italy, that I am happiest with twill and damask weaving and it seems to come naturally to me. I will use as my inspiration for the structure, Angstadt 16 shaft twill profiles. So far I have determined that I will be using white 10/2 perle cotton in the warp, 8/2 unmercerized cotton in the weft, and various colors and widths for the colored stripes. I have selected a beginning sett of 20 epi based on my previous experiences with this structure. 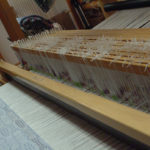 I have chosen to weave this on my AVL loom using the compu-dobby to help me pick the pattern and I will have to concentrate on the weft color changes manually. I have decided that I will be weaving 18 towels in all and therefore will be winding a warp 15 yards long on the sectional beam. 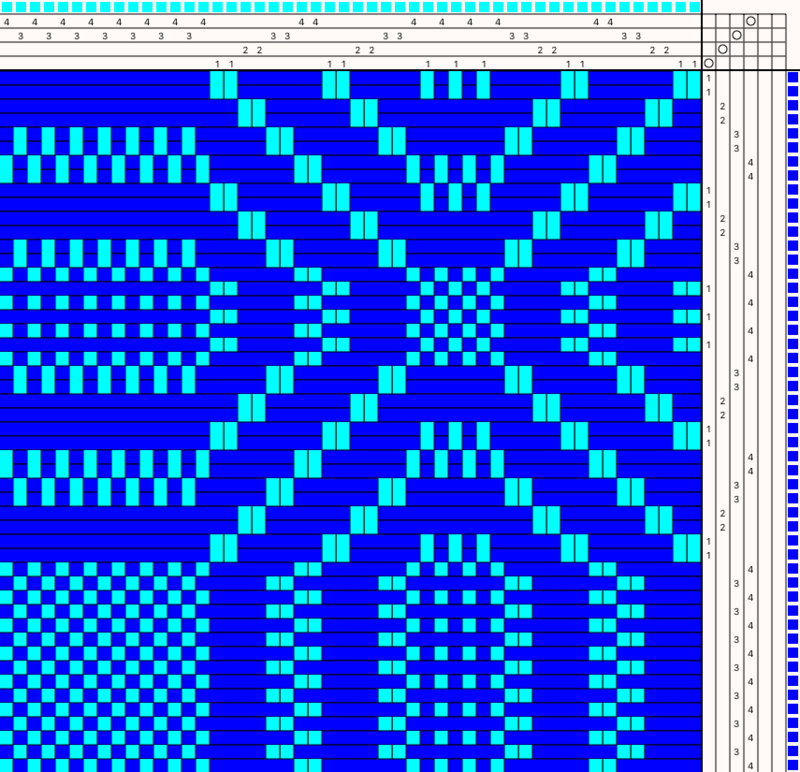 A beautiful block pattern to be woven on four shafts. Notice the tabby tie up. The warp is dark and the weft is light. 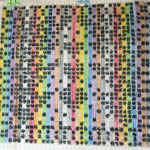 Imagine the interesting patterns you can create by changing the weft colors.